As a child of the Great Depression, Foster Sayers was on familiar terms with dark days, an empty stomach and uncertainty about where he would lay his head on a given night. In those days, life was hard for a lot of people; harder than most for the youngster who bounced from one foster home to another in northern Centre County. “He had an awful rough life,” his son, Foster J. Sayers Jr., told me in a 1995 interview. “He got shipped from one farm to another. He got treated poorly. Yet for all that, Sayers retained a pleasant personality when he could have gone the other way. Most likely, that personality is why someone was always willing to take him in, give him shelter and a warm meal — that, and his strong back. However, likeable as he might have been, Sayers had a dark side. At the various firemen’s carnivals so prevalent at the time, he had a reputation as someone not to be challenged, someone who was as capable with his fists in a fight as in the hard work on the farm. In time, Sayers met a young Howard woman named Ellen Gardner and a romance blossomed. They spent many an evening going for walks around Howard, a typical courtship activity in those days. Eventually he joined the Army, and when he came home on leave in the fall of 1943, they married. In May 1944, he shipped out for Europe, leaving behind a wife who, unbeknownst to him, was pregnant with his namesake. That fall, his unit, Company L, 375th Infantry Regiment, 90th Division, was attached to Gen. George S. Patton’s 3rd Army as it began to drive across Europe as part of the Rhine Winter Offensive. On Nov. 12, 1944, Sayers and his unit came to a small hillside outside of Thionville, France, near the border with Luxembourg. A group of Germans occupied the top of the hill and was pouring machine gun fire into the Americans as they tried to cross a small creek at the base of the hill. With no cover, the GIs were sustaining heavy casualties. It was one of those times that called for someone to stand and deliver. Sayers got to his feet. Maybe it was one of those times he started shaking. In any case, before long German soldiers started going down as Sayers picked up his .30-caliber air-cooled machine gun and began running up the hill toward the entrenched Germans. He got to within 20 yards of them and began firing into the emplacement. While this was happening, the rest of his company was able to use the distraction to outflank the German position. At this point, Sayers again picked up his machine gun and ran to the edge of the German position and began firing directly into it, killing 12 enemy soldiers before retreating behind a nearby log from where he continued to fire his weapon. By now, Sayers had the undivided attention of the German troops who concentrated machine gun and rifle fire on his position, killing the likeable orphan from Howard. They said he didn’t die right away, succumbing on his way to the hospital behind the lines. As a result of his heroics, every German soldier on that hill was either killed or captured. 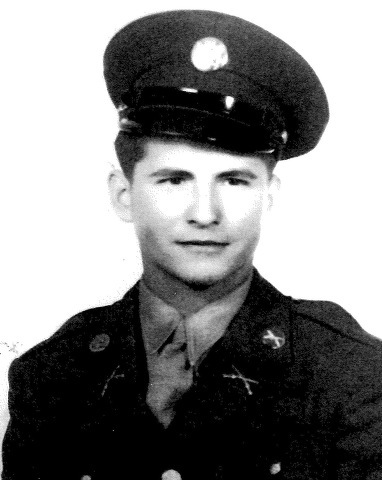 Initially, Sayers was recommended for the Distinguished Service Cross, the second-highest medal the United States military awards. Later, when his actions were reviewed, the recommendation was upgraded to the Medal of Honor. Back home in Howard, Ellen Sayers went about her daily life, taking care of their son, Foster J. Sayers Jr., who had been born Aug. 7 of that year. She would not learn of her husband’s fate until Dec. 8, 26 days after he was killed. Later, Sayers’ belongings arrived in Howard, along with the boxes of Christmas gifts she had sent him and some unopened letters. Also arriving were a doll he had bought in France for the baby he had been certain would be a girl, his wallet containing some French currency and a wristwatch he had been wearing when he was killed. If you pull the stem on it, the second hand whirs wildly. Speculation is that the shock of the bullets that killed him damaged the inner workings. Sayers was brought home to Howard in the winter of 1949 and buried in Schenk’s Cemetery. His remains were later disinterred and moved to the new Schenk’s Cemetery along Route 150. The move was necessitated by the creation of the dam in the Bald Eagle State Park that bears his name. Finally, the kid who knew all about hard times and hard work had a place to rest. Editor’s note: Portions of this article appeared in the Centre Daily Times in 1995, and are being re-published with permission. 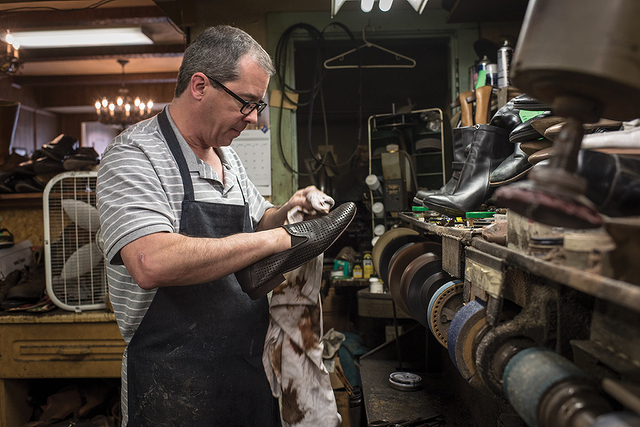 In a digital world filled with disposable goods, skilled artisans who work with their hands are becoming increasingly rare. The desire to develop tangible, tactile skills seems to have been replaced by the ease with which we can purchase whatever we need with the push of a button. Trades that used to be passed down within families from generation to generation are vanishing.